At Mader we understand communication is a key ingredient in developing a successful work place and to develop good relationships with our clients. Abbie O’Brien, who is currently based at Boneo Park Equestrian Centre on the Mornington Peninsula training, but is a current member of the Dressage Tasmania and on the State Young Rider squad, was one of four girls representing Tasmania at the titles. Abbie, originally based at Penguin, made the move to Victoria to gain additional training and experience through exposure to a greater competition schedule available for dressage. Abbie competed two of her horses over the weekend. 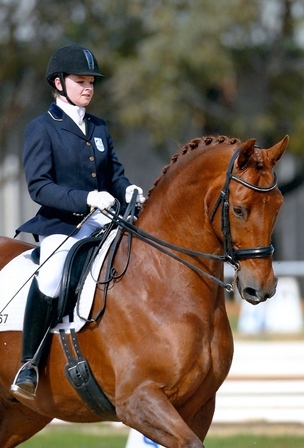 On Saturday, riding Rajah’s Rave, she competed in the Advanced level of the competition, riding two tests and winning both with scores that could qualify the combination for the National Equestrian Open Championships in Sydney later in October 2014. By winning both she was awarded the Victorian Championship and also won the Zarina Perpetual Trophy. This is a substantial achievement for a dressage combination from Tasmania, where the horse and rider are learning together from basic dressage four years ago to this higher testing level and shows the progress and commitment after also winning at these championships 2 years ago at the lower dressage levels. Also at the event over the weekend was one of Mader’s major Victorian clients, National Patient Transport, who were commissioned for the event by providing the required level of medical support and displayed a professional service to ensure the competitors were comfortable with this aspect of the competition.